Constable Heber Gasu had the opportunity recently to meet Constable Jessica Moorby during one of his group visits to Police Eagle and Deodar. 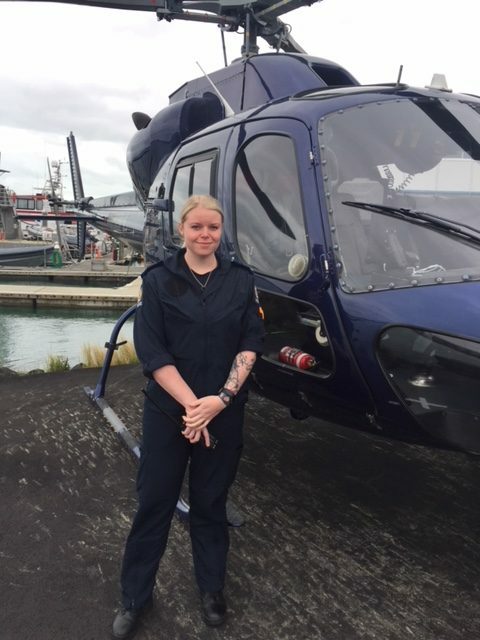 Constable Moorby was previously a Patroller with CPNZ North Shore (now North Harbour) and served her community for just over 18 months before going off to Police College. She said “it was a great stepping stone into joining the Police” she also said “that it gave her a little bit of an insight on how and why prevention works”. of every day knowing that I’d done something, no matter how small to help our community”. Jessica also stated that she had a very well paid job prior to joining but didn’t get the satisfaction nor the thrill she gets from policing. 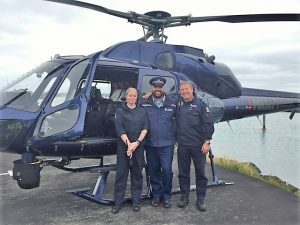 Constable Gasu asked her to describe a normal day for her at the moment, “My current role is probationary tactical flight officer (TFO) for the Air Support Unit – most people know us as Eagle. I’m still currently learning so I’m always partnered up with a senior TFO. We usually attend jobs in the greater Auckland region however if we’re needed then we can travel as far around the country as required. It is very hectic and full on at times as everything is time critical and information always needs to be 100% but it’s a fantastic job and there’s always something new to learn”.